Welcome readers !!! This section here provides links to many E-Books, Blogs, Sites and many more on C/C++/JAVA/PHP/SQL/C# and many more. So feel free to browse through and comment :P.
and i will mail you a link where you can find what you are looking for. a book by deitel,C How to Program, 6e, is ideal for introductory courses in C Programming. Also for courses in Programming for Engineers, Programming for Business, and Programming for Technology. This text provides a valuable reference for programmers and anyone interested in learning the C programming language. 2 - C++ for Programmers : Another deitel book.Written for programmers with a background in high-level language programming, this book applies the Deitel signature live-code approach to teaching programming and explores the C++ language and C++ Standard Libraries in depth. The book presents the concepts in the context of fully tested programs, complete with syntax shading, code highlighting, code walkthroughs and program outputs. The book features 240 C++ applications with over 15,000 lines of proven C++ code, and hundreds of tips that will help you build robust applications. 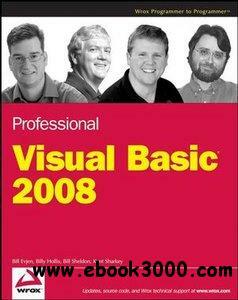 The 2008 version of Visual Basic is tremendously enhanced and introduces dramatic new concepts, techniques, and features to this popular object-oriented language. Written by an elite author team, this comprehensive resource provides a clear and concise approach to using VB 2008 in the ever-expanding .NET world. This book focuses on using the latest and most powerful tools from the Microsoft arsenal within your Visual Basic solutions. You?ll examine everything from the .NET Framework to the best practices for deploying .NET applications to database access and integrating with other technologies.